Far from being the last dream of my soul; the concept of twinned towns has ranked moderately high on my list of pondering priorities since a family friend once cycled for charity, from Amersham to Bensheim and back again. Naturally any such undertaking would need a certain level of training (for which there isn’t yet the time) and/or fitness (for which there remains only a pipe dream) but, testing the water is always a fine starting point for those of a not-so-healthy disposition. So after a little somewhat hasty and haphazard research, leaping in feet-first without science or even a petri dish, Test 1 would be to conquer a true Anglo-Saxon union – The all-powerful Berkshire-Bayer Alliance – naturally whilst misquoting Dickens (something I spent considerable time doing at school). Getting the logistics out of the way early on; thirty minutes drive west of Heathrow airport stands the town of Bracknell. Similarly 30mins drive south of Düsseldorf Flughafen sits Leverkusen. As such it would not be unreasonable to boast that, many short daily flights join the happy couple. A fantastic day-double might even be achievable if timed perfectly. Bracknell is home to some electronic specialists and a middle class supermarket; Leverkusen is home to one massive chemical company and a big sign. Both have train stations, rivers, trees, and houses where folk have no doubt judiciously shown their cats, milk, if they wished them to come inside. Unquestionably there’s more to it but to any self-respecting layman, in 1973 – no doubt with the aid of pocket Collins and Langenscheidt dictionaries – the towns of Bracknell and Opladen became pen pals, respectively marking the occasion with much wringing of hands and a spate of street-naming. Opladen Way went to the west, Bracknellstaße to the east. Fittingly both thoroughfares were located within easy walk of the respectively twinned stadia. Two years later Leverkusen annexed Opladen and subsequently took over their Bracknell pen pal duties. At this juncture, a few more roads were thrown in for good measure. Rather than suffering a clammy and intensely cold mist, tonight was just plain-old cold and dark. 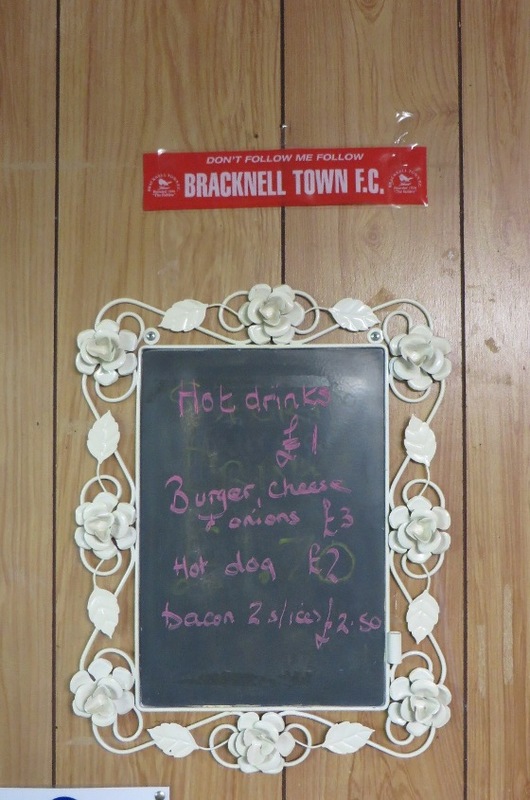 I’d like to be more descriptive but, having missed my chosen Bracknell turning at least once; there was a modest fear of actually missing the warm-up, both mine with Bovril and the players with ball. Exiting the car, numerous extra layers were quickly donned and photos of the turnstiles snapped, before heading inside and out again (you’d understand if you’ve been there) to the deceptively pleasant clubhouse. Outside, the fine drinking hole resembles something slightly more attractive than the jumbled functionality of 1950s rebuild (this may of course improve with daylight); inside was a bustling country hostilery. It’s not inconceivable that it may actually be a tardis. 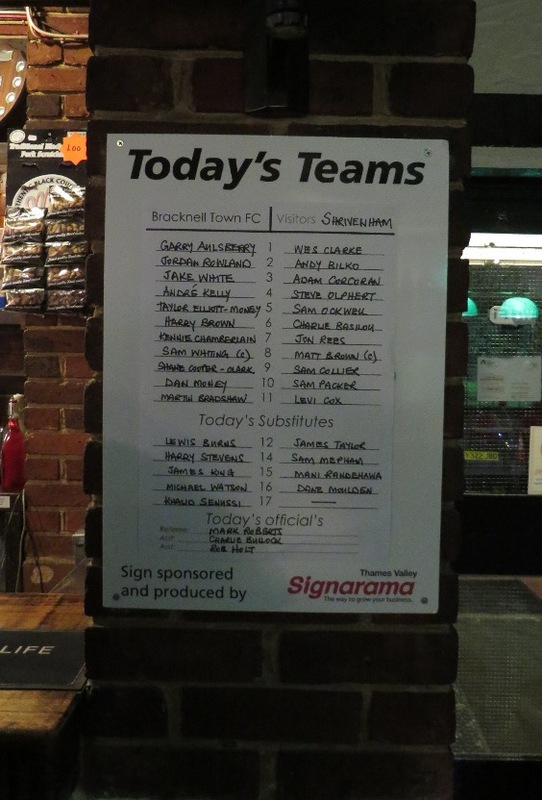 Having made pleasantries and photographed the team sheet – a whiteboard at the near end of the bar – with a real need for inner warmth, I strode off for the tea bar. There, sandwiched between a small lounge and a chilly corridor to the changing rooms, a friendly couple offered all manner of refreshments and conversation. Under-the-counter biscuits were even available once the chocolate cupboard ran bare during halftime. 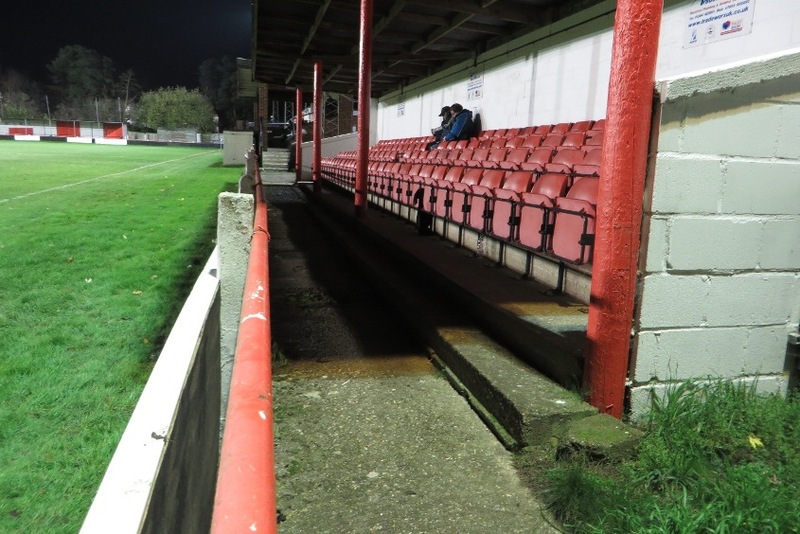 Outside, away from the amiable courtesies, the warm-up was drawing to a close and about to make way for ninety minutes of indiscriminate shouting. 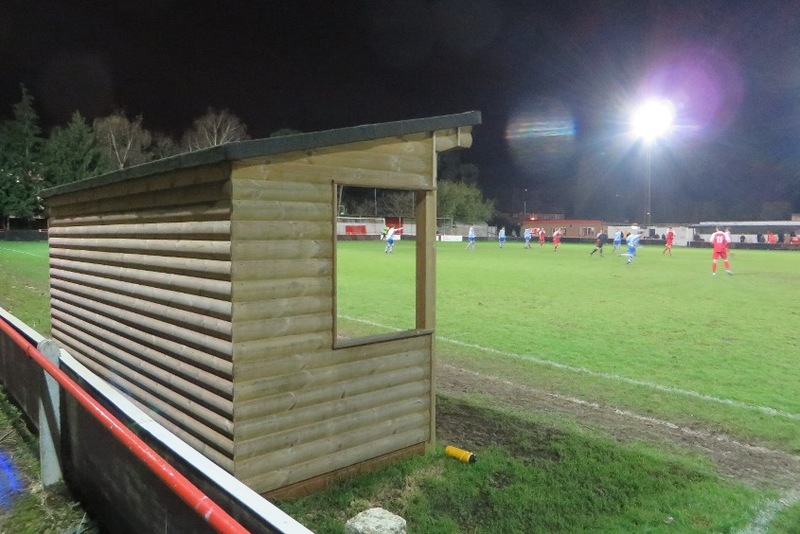 Backing on to the club house sits a modest stand (or two) and an even smaller covered terrace. 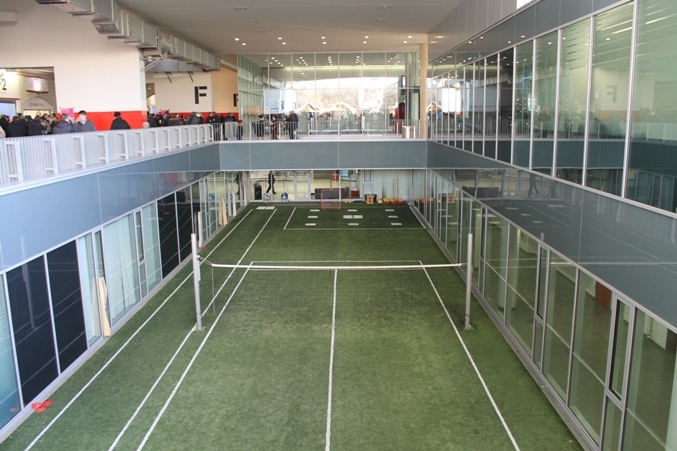 Behind the uphill goal – to the right – is the only other covered area. 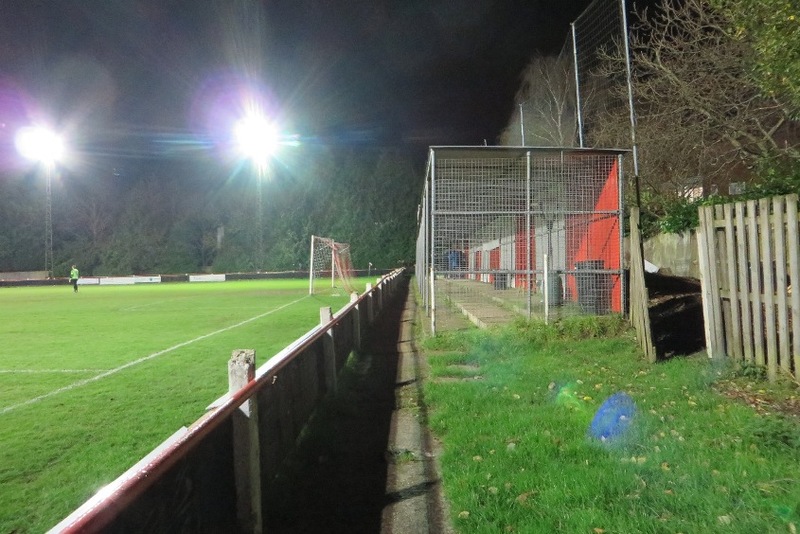 At the bottom of this rural ground, just a small walkway dwells behind the goal. 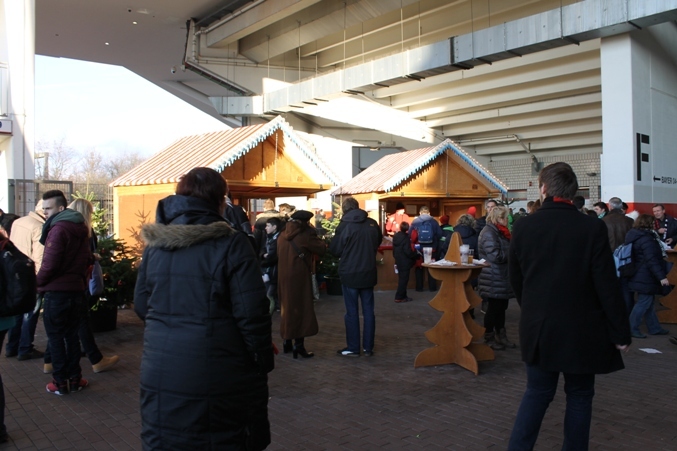 Across the far side, two very admirable Swiss-style log cabin dugouts had been erected (maybe they do full alpine dress during Oktoberfest?). Still undecided as to who won the toss, it was very clear the visitors spent the first period benefitting from shooting downhill. First Jon Rees had a shot headed clear then, he lobbed just over from distance. 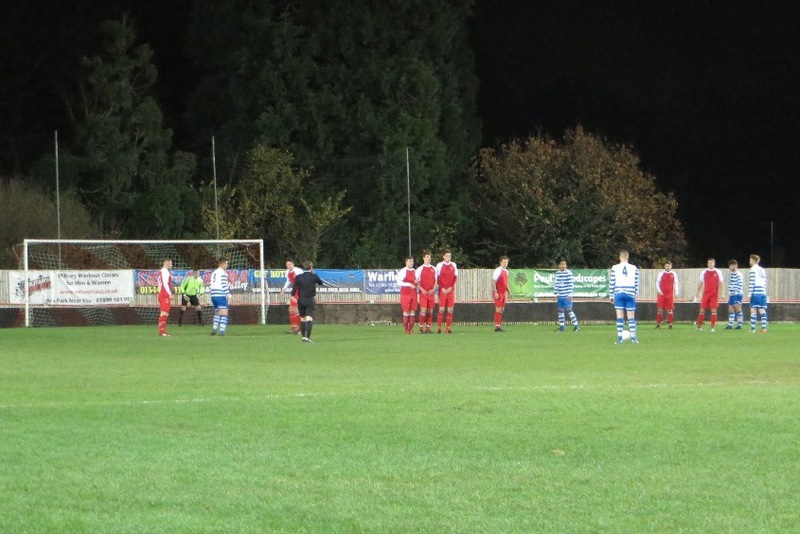 This was followed by a Steve Olphert free-kick also going over and, a desperate goal line clearance by Robins’ André Kelly, following a testing and low Levi Cox cross. For thirty minutes – mutual shouting aside – it was pretty much all downhill and all Shrivenham with it. To that point the scrappy one way traffic had brought with it, testing half-hearted tackles and increasing displeasure voiced all round. 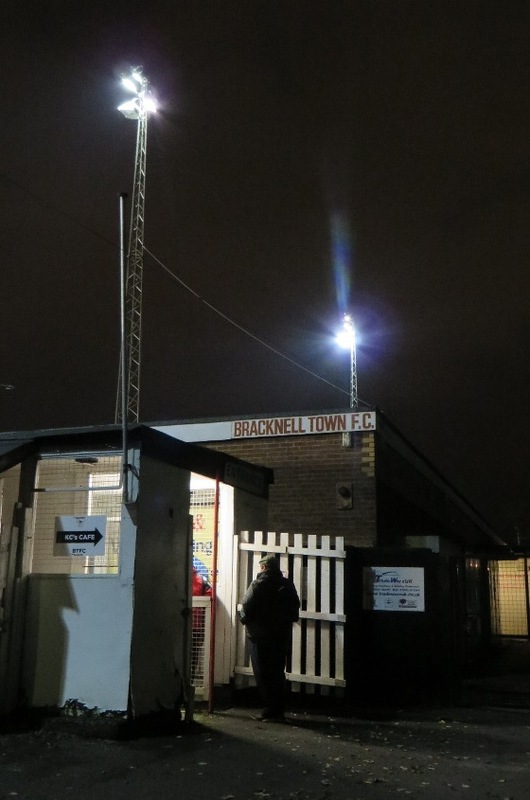 Once Bracknell went ahead, the vulgar past time of verbally abusing anyone within earshot got up a real head of steam. Doubtless, all through the cold and restless interval – hopefully to quell this tendency – the managers once more whispered guiding instructions in players’ ears. Outside we were left to our own thoughts. 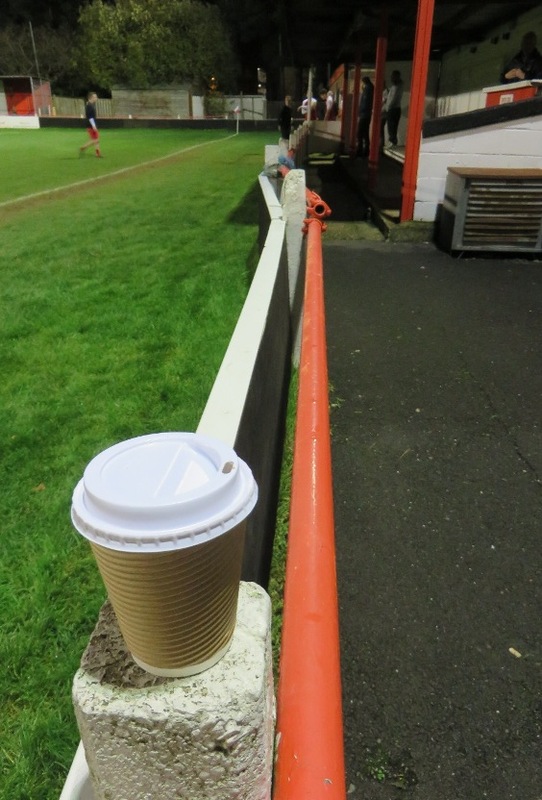 Having missed out on a half time draw for the umpteenth time in my life – as my second piping hot coffee thawed extremities – I’d have been justified in venting some annoyance. Out on the pitch however, not one of them had any justification; almost every mistake was of their own doing. 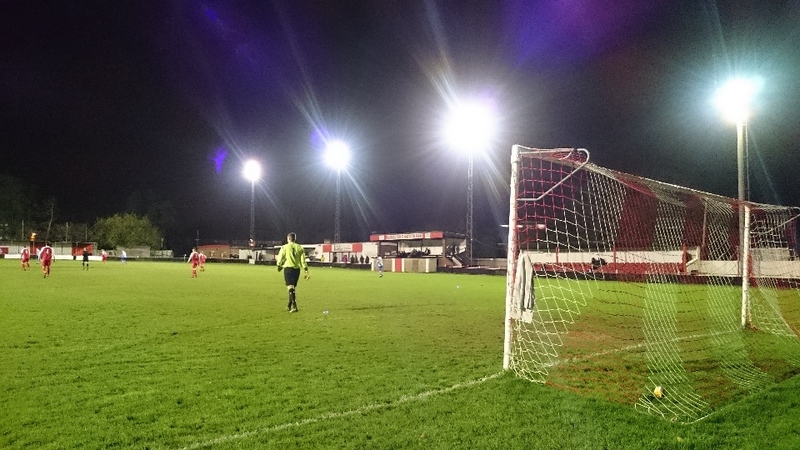 Shrivenham had failed to take any of their early chances which would have probably won them the game; Bracknell had been almost inept at the start but, the advantage now afforded them was only leading to one outcome. With both benches imploring players to “Keep plugging away” Dan Money’s header almost fooled visiting stopper, Wes Clark, sub Khalid Senussi tore into the defence and, frustration levels hit the roof. “REF!!! Can they talk to you like that?” came a yell to my right. Flippant yes but, certainly more engaged than the three young ladies in the stand to my left festively debating; Elf or Love Actually? With Bracknell hell bent on making up for their first half lethargy and, Shrivenham seemingly having mentally swapped places with the hosts, the lead was doubled when Cooper-Clark latched onto a fine Sam Whiting pass, turned his marker Sam Ockwell and slotted home. Basilou soon saw red – for the double offence of a poor challenge on Whiting and then petulantly roughing up Rowland in the predictable melee that ensued – and Money tapped in a third just before the end of an unattractive yet engaging second half. 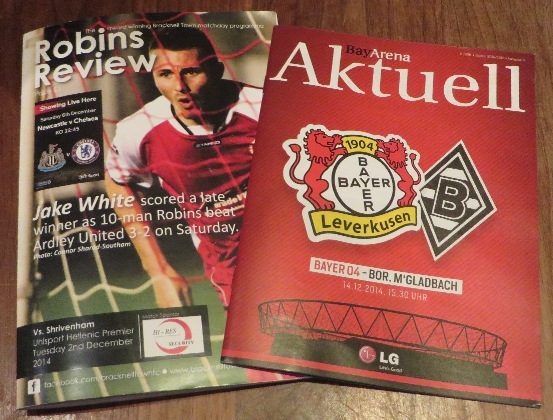 Whilst a fourth goal could have been added too, the bonus for me was finding a fine write up on the adventures of “twinned” Leverkusen in the programme. Though unreciprocated in Nordrhein-Westfalen, it’s a feature that many clubs could and should adopt. Newport County and Carl Zeiss Jena, Hertha Berlin and Shoreham, Corinthian Casuals and just about any club worldwide casually named after a biblical book. On the freezing drive home, 5 Live boasted of being “in tunnels up and down the country, bringing you all the reaction to all the games”. Having just walked past the tunnel at Larges Lane, I can assure you, they weren’t and didn’t. 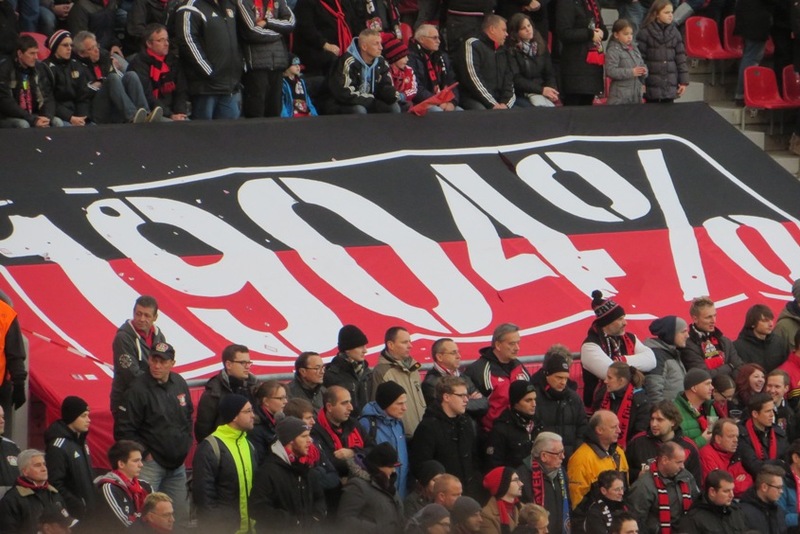 With a population not dissimilar to High Wycombe, city or not – if for no other reason than obtaining a natty title – I’m treating Leverkusen as a town. Think of that what you will; trust me it’s more courteous than the way one Hamburg fan was describing Bayer Leverkusen and “andere neues mannschaften” to me the day before. 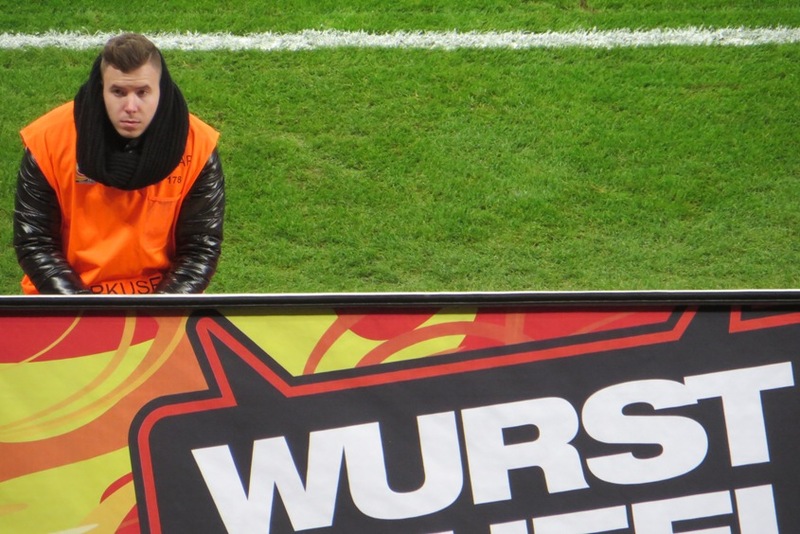 There is a perception by some fans of more self-proclaimed “traditional” German teams – a standard probably determined by the percentage volume of kutte jackets in respective stadia – that new money is ruining the game. Hmmm, where have I heard that before? In England, those with even a moderately average IQ could attest that Murdoch’s thirty pieces of silver have fuelled a hideous greed “since the premier league”, as the saying goes. 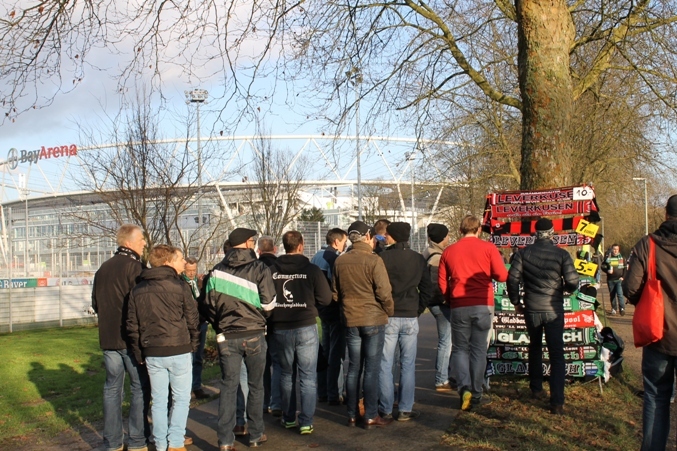 In Germany the ire of said supporters is directed more towards the privileged backing that a handful of teams enjoy. At this juncture I won’t even delve into the indefensible and odious background of the Leipzig outfit however; Paderborn, Ingolstadt, Wolfsburg and Hoffenheim all came in for criticism for being such “neues” clubs during a brief and cordial rant. Knowing their club’s history and having a fond attachment for BRC08, and with Ferdinand Porsche’s finest design being my eternal vehicle of choice, at least two of those “neues” debates I can comfortably reason away; the rest will need further research. Having met on board, we arrived in Leverkusen by train from the north; my son, me, and one half of the Uhltras’ scribes. One I might add that whilst being late, the locomotive did have some excellent technology for alighting wheelchairs. The sun was still shining but a chill was clearly settling into the breeze as we got off five stops later. “It’s just a short walk” exclaimed Christian pointing into the distance at something us shorter folk couldn’t make out. Down slopes and, through parks where der Polizei were parked badly; past houses guarded by elephants and, a glorious gravel pitch with wooden dugouts and a bar. 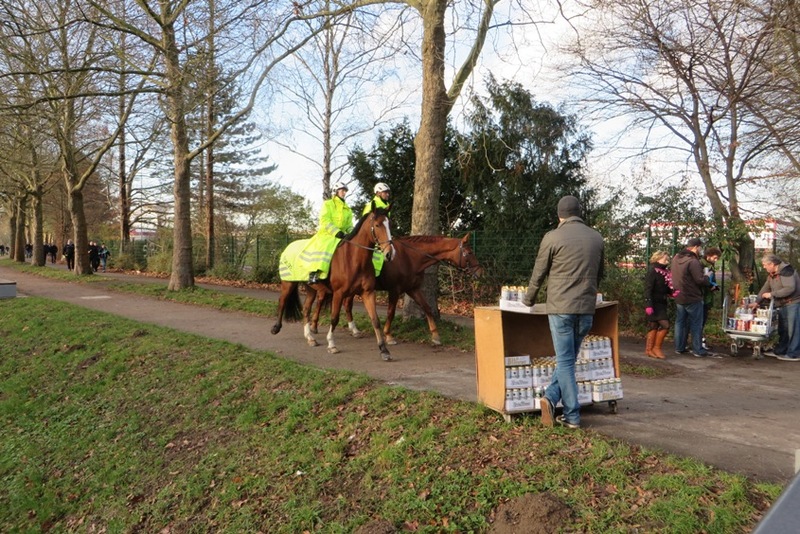 All the while with my freunde timing our path, to gauge the timings for trains back to the airport; along the canal, across the footbridge and there… There beyond the footpath where bier sellers peddled their wares before the on looking mounted police; There was the BayArena. Well! 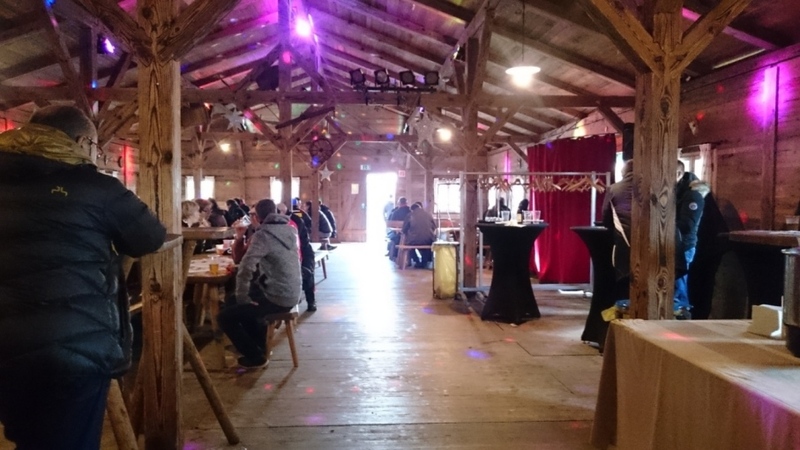 And hallo you, nice Swiss-style cabin bar in the car park. 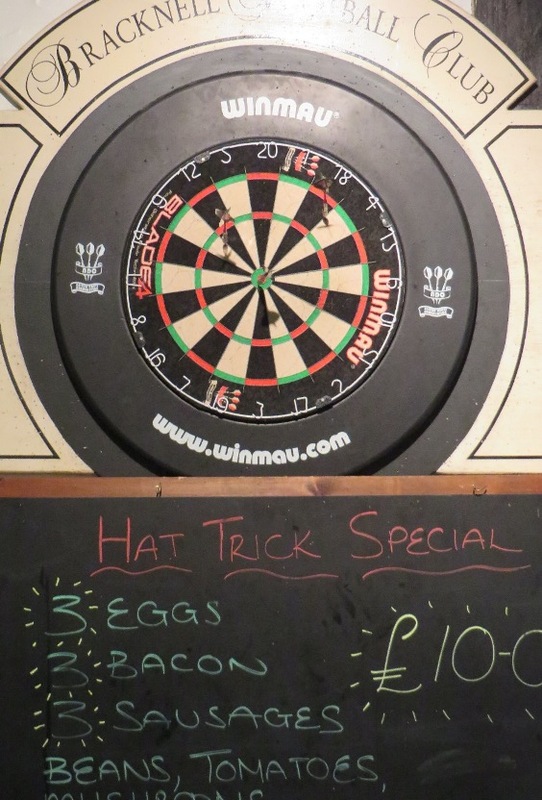 We’d had to circumnavigate almost the entire arena to find this watering hole. Whilst we didn’t investigate whether fans occasionally donned alpine dress inside – I could see from the more inebriated sing-a-longy types they might – there was just a huge relief that we’d found sustenance and avoid this hideous possibility of going in the all far too common burger chain across the road. Inside the stadium, there’d be no food or drink; inside the stadium was cashless catering. Cards aside the log cabin bier und wurst made for a great lunch, in a very friendly atmosphere, where fans of both clubs could mix. Back outside afterwards, we completed the external circumnavigation and headed for the turnstiles and a quick pad-down. Underneath the stand there was time to admire the club shop, a volleyball court, a Weihnachtsmarkt and the rather clean if crowded facilities. A tidy new build, three-quarters concrete bowl and one odd end; if it weren’t for the corporate stuff behind the odd goal, the stadium almost has the appearance of a miniature Twickenham circa 2004. Out in the posh area (wife’s boss sourced these tickets) there was the strange experience of the seats being made of unfoldable rigid plastic, with a drainage hole beneath one’s behind. On each a Christmas chocolate had been gifted by club sponsor LG. 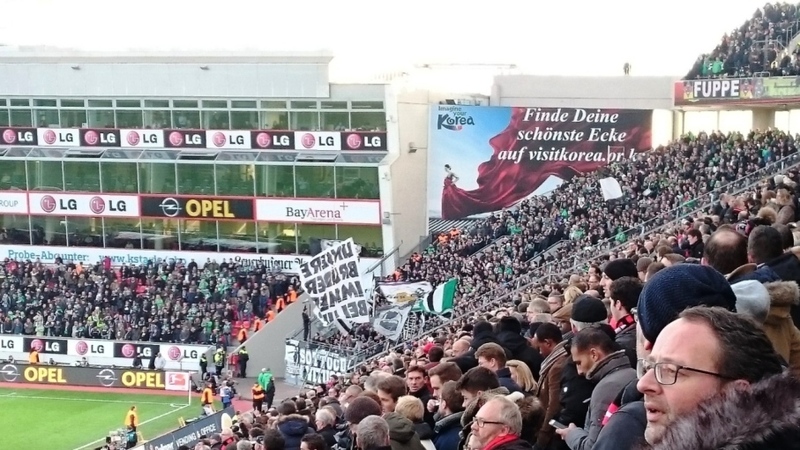 To our left, Leverkusen’s faithful were busy waving flags; Borussia Mönchengladbach’s noisier following occupied a small corner to our right. The rest of the ground was an even and amiable mix of both green and red. They may have even been a good case to state that more away fans were at the match. Did anyone count? Assuming we’d be supporting the home side, my son set about studying their form and fans. Remembering former eras and family connections, Christian and I were leaning towards the green quarter. Deep within the solitude of a multitude of people we watch the unfolding drama. Though both teams spent the next ninety minutes showing their qualities, the opening exchanges saw two late Bayer challenges setting the tone for this even and combative encounter; new v old, fourth v fifth. 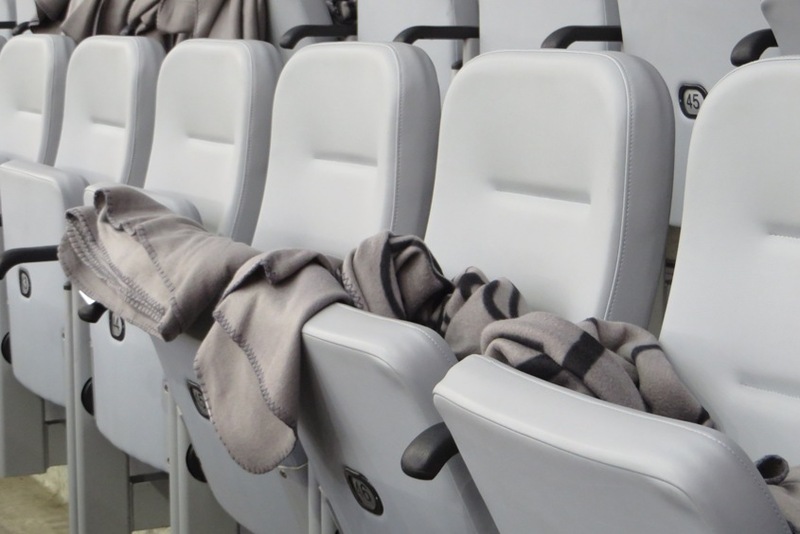 With little to show between the teams, it would be ten minutes before the visitors made the first real opening. Patrick Hermann and Max Kruse broke at speed but, the final shot swept wide of the left post. 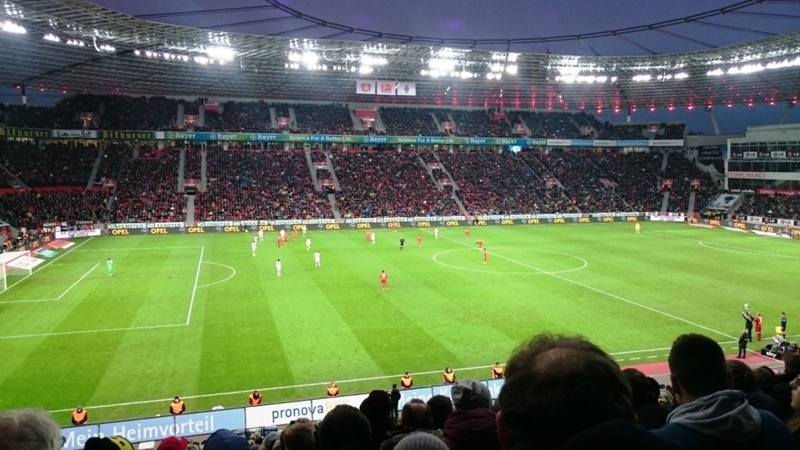 Five minutes later Leverkusen’s Karim Bellarabi shot from distance, comfortably being saved. To find phone data being blocked during a game is one thing; to still subject fans to flashing ads for all manner of companies, and Salzburgerland, was unforgivable. Glancing about it was telling that no one seemed to pay either much heed. 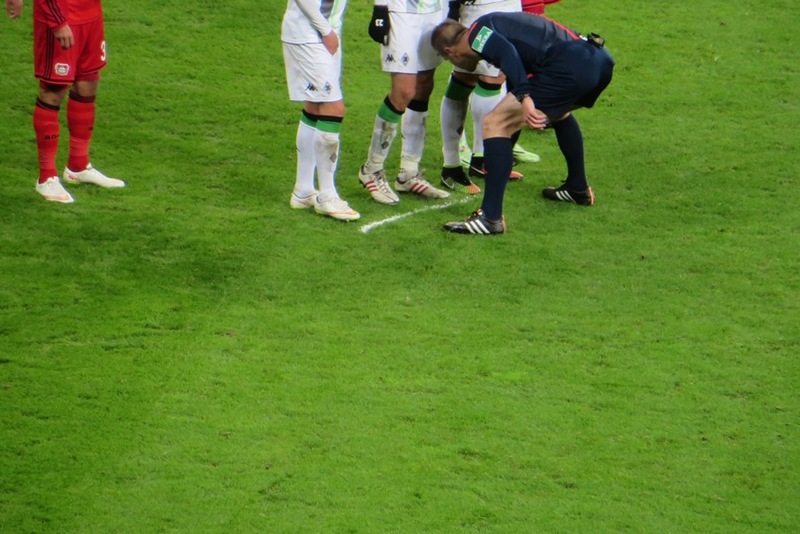 More interest went to the near linesman toppling over an injured Mönchengladbach player who was being treated on the touchline. 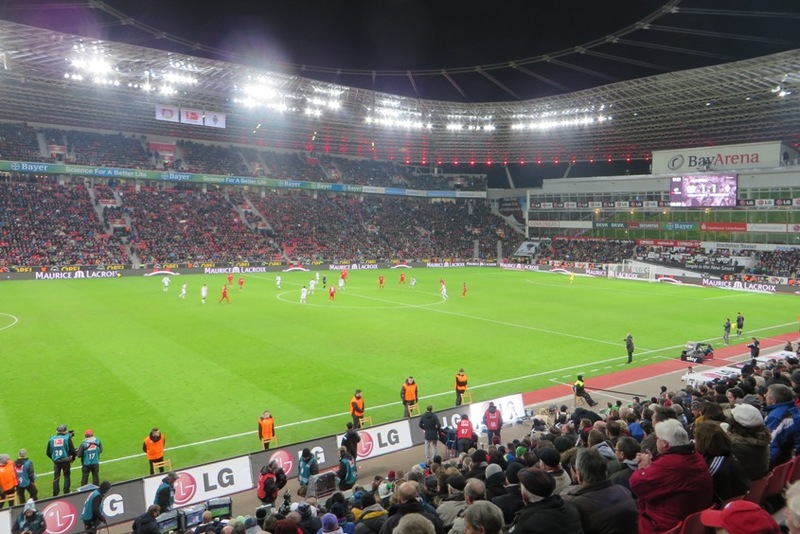 Seconds later Leverkusen were ahead as Hakan Calhanoglu – collecting Stefan Kießling’s pass – lobbed Yann Sommer from distance. The goal opened up the game and, with both sides attacking at will opportunities flowed. Most were blocked or defended well – one was spurned when André Hahn absurdly went to ground long before the challenge – but the equaliser was both fair and inevitable. Fielding questions from my son about the “BROT HERS” banner and its association with bread, we almost missed Roel Brouwers volley home from the near the penalty spot, after his sides corner had been headed clear. With breathing space afforded us both I explained the grammatical error and then pointed out a banner that would annoy a pedantic me the most; 1904% indeed. Though open in the most part, Mönchengladbach were the ones in the ascendancy after the break. Yes, Hahn was still demonstrating the lack of Shredded Wheat in his diet but, twenty one others were having a good game. Kruse again shot wide early on however, with chances becoming fewer as the time drifted by, players on both sides were hoping for cheap free kicks to give some advantage and breakthrough. When the final whistle came, deserved mutual applause rang out. It was a very fair result, in a very entertaining game but now, we had a flight to catch. With time tiking away it could have been the best or worst of times however, making it back to the checkout desk just in time, I glanced at my wife patiently waiting with our cases and was extremely grateful. Deep down I knew enough of the world to know that, there is nothing in it better than the faithful service of the heart… and football of course. 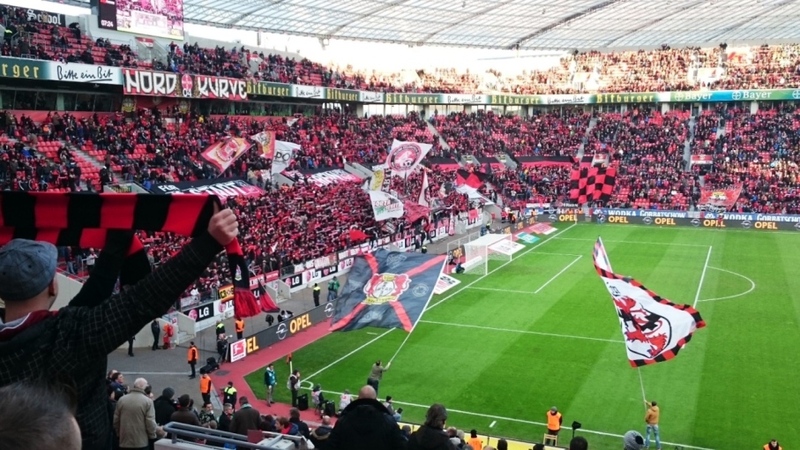 This entry was posted in 2014-2015, Bundesliga, Hellenic League and tagged BayArena, Bayer, Bayer 04 Leverkusen, Bayer Leverkusen, Berkshire, Borussia Mönchengladbach, Bracknell, Bracknell Town, Bracknellstaße, Bundesliga, Hellenic League, Larges Lane, Nordrhein-Westfalen, Opladen, Opladen Way, Robins, Shrivenham Town FC, Twinned Towns, Uhltras. Bookmark the permalink.